FSB is that the boulder attack replaces your special, does 3 hits, changes to +15 BtH lean, auto-hits, and does +50% Melee damage. ^The boulder Attack gets a 15bth? But it auto hits does it not? Or is that just the weapon specifically? It gets a +15 BTH lean, meaning more accurate but less powerful. It's basically a different way of saying it has a damage penalty. Ranged Earth Shortbow, no BtH lean or base/rand lean. MC effect is on a toggle, in damage mode it just does +5% damage, in status mode the bow fires off two shots and attempts to Petrify the foe. This lasts 1 turn, has a 50% save inflicting with player DEX/LUK vs mob END/LUK. The petrify attack has two hits and pays 45% Melee + 5% MC for a total of 50% Melee, so you have a (54.63*Hits/2)% chance to attempt the Petrify. This bow has the same deal as the Morningstar Crossbow/Whip, if you're in the Morningstar armour it deals +25% damage and its +2% boost as a no special wand/bow changes to the +9% boost that a no special non 100 proc weapon would get. Ranged/Magic Light Shuriken/Thrown weapons. One Ranged and one Magic version. 0.2 base lean. Non-MC trigger for +10% damage versus Undead/Zombie/Demon mobs, -5% damage downtrigger. MC bonus is skill compression. You can pay 100% Melee in SP (75% for the Magic version), to do a double damage version of the normal 100 proc attack. Essentially just paying SP for double damage. Similar to the whip, if in the Morningstar armour, it deals +25% damage and changes from the +2% damage boost that 100% proc no special weapons have, to the +9% one that 0% proc no special weapons have. Basically it's only SLIGHTLY weaker than using a regular no proc weapon when in the armour. 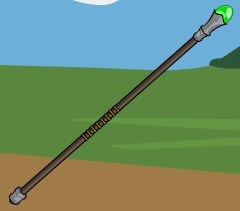 Ranged Earth Crossbow. No base/rand lean, has a +6 BtH lean due to being a crossbow. Usually deals Earth damage, MC is that it will deal +10% damage and seek between Earth/Fire/Light elements vs any Undead/Zombie/Werewolf foes with no downtrigger. Has the same damage boost as the whip and crosses when in the Morningstar armour. 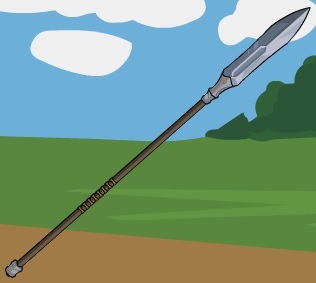 Info on the Dragon Lance (thanks Kamui! ): "They're basically a Fire Dragon Blade with no downtrigger. +5% vs non-Ice Drakel/Dragonkin, +7.5% vs Ice Drakel/Dragonkin & non-Ice Dragons, and +15% vs Ice Dragons." Melee Earth Club. -5 BTH lean. Special deals damage based on the monster's HP. It does [Monster Base HP]/6/1.3 damage total over 3 hits, to a minimum of [25% of a weapon Special with all its damage on Base damage]. This gets multiplied by the same outlevelling formula as the Skull Club (although without the class mods). MC Magic sword. Click the handle to swap between -5 and +5 BTH lean. Every turn, you gain 2 Tranquility Charges. Click the blade to spend 11 charges to make your weapon attacks auto-hit for this turn. This sets the BTH lean to 0. If you have one other Kindred item equipped, you gain +1 charge per turn. If you have two or more, you gain +2 charges per turn. Special is two hits, Magic Water. The BTH lean is doubled (to -10 or +10). 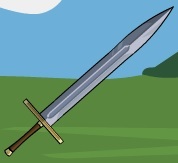 MC Water Melee sword. Click the handle to swap between -5 and +5 BTH lean. Special is one hit, Magic Water. BTH lean is doubled (to +10 or -10). Every turn, you gain 2 Tranquility Charges. Click the blade to spend 15 charges to make your weapon attacks auto-hit for this turn. This sets the BTH lean to 0. MC Ranged bow. Click the handle to swap between -5 and +5 BTH lean. 100 proc. Does a normal bow attack 80% of the time and a weapon Special 20% of the time. Bow attack is two hits. -10% damage, unless you're in the Kindred armour, in which case it does +9% damage and gets the Kindred armour lean. BTH lean is doubled (to +10 or -10). Special is one hit, Magic Water. BTH lean is doubled here too (to +10 or -10). +15% damage for everyone during July, +5% outside of July only if you are a Guardian. Same deal as Chibi Loco. The special is when the arrows get shot into the air right? I'm not sure if it is just me but for "Kindred Humility"
the special seem to be doing two hits. Darkness Sword, click hilt to swap Melee/Magic, click blade to swap HP/MP/SP mode, has a 0.65 random lean and a neutral BtH lean. Weapon MC is that it heals the user's HP/MP/SP dependent on damage done. Healing amount is divided by MobDarkRes, since otherwise the weapon is disproportionately stronger on stuff with higher DarkRes. Normal MC is 5%, so we can have it heal based on 5% of damage done. HP healing is just 5% of DmgDealt/MobDarkRes, MP is HPHeal*1.5, SP is HPHeal*1.125. Energy Sword, click hilt to swap Melee/Magic, neutral base/rand and BtH lean. Basically an Energy clone of Kusanagi, base hit rate is 50%, STR or INT gives 12.5%, DEX gives 12.5%, and then LUK gives a final 10% to reach 85% total. Assuming player only has STR or INT so the weapon should deal only 62.5% damage, +5% due to MC, so weapon does 67.5% damage total. Weapon attacks and specials auto-hit, but weapon does *0.675% damage. Basically an Energy clone of Kusanagi, base hit rate is 50%, STR or INT gives 12.5%, DEX gives 12.5%, and then LUK gives a final 10% to reach 85% total. Assuming player only has STR or INT so the weapon should deal only 62.5% damage, +5% due to MC, so weapon does 67.5% damage total. Weapon attacks and specials auto-hit, but weapon does *0.675% damage. Kusanagi was released before Version 39 of the game, which saw some changes to the bth formulas. STR or INT now gives 15%, DEX gives 15%, and LUK would give the final 5% to reach 85% total. With the formula updates, Kusanagi/Perfect Blade should thus deal 65% damage, +5% due to MC, for a total of 70% damage instead of the current 67.5%. MP cost values are inaccurate. For Lvl 135 MPCost1 should be 569. MPCost2 is 342. Might wanna check if anything else is inaccurate. Also, are the spell base and rand damages for the total damage or for each hit? @Valent: Fixed, both Kusanagi and Perfectly Balanced Blade now just do *0.7 damage for their auto-hit penalty. Kindred's Enlightenment, Humility and Prestige have the same problem of being on the older stat formula standards, 15 Charges *2.5% power per charge is 37.5% which means the assumed base hit chance is 62.5% instead of 65%. The correct Charge requirement for Enlightenment and Humility is 14 and for Prestige is 10.5 with the decimal, since Charges gained per turn are able to have decimals. Melee Fire Club and Melee Light Club, has a 0.25 base lean, a +3 BtH lean and MC effect of a further +4.25 BtH. Special does two hits and has a further +5 BtH lean, for a total of a +8 BtH lean. Update: Kindred weapons' effects now cost 13 charges (Melee/Ranged) or 10 charges (Magic). Balance: It's impractical to assume 200 INT / 0 DEX / 0 LUK; you have to use the weapon for so many turns without the autohit that any exploitation is minimal. Assume 200 INT / 100 DEX / 100 LUK (ignore lower levels). That's 75% accuracy. Autohit means you deal 1/0.75 damage, which is 33.33% or 13.33 charges; round to 13. Magic is *0.75 that, so 10 charges exactly. So even at 0 cha Kindred pet now allows you to auto-hit every turn? There is a inconsistency in the equations of Auto hit penalty being based on 1/(.75) = 33.33% melee or (1-.75) = 25% melee like Kusanagi/Perfectly Balanced blade, I recommend officially annoucing which one should be the standard here. The first form is consistent with how save bonuses and BtH leans are calculated in status conditions, but gets inflated the lower the divisor is but the second form is the traditional flat value exchange, which would result in 10 Charges for melee/ranged and 7.5 for Magic, do keep the decimal like how Scarab Axe/Mace does it for the MRM to prevent power creep from rounding. Kindred's Enlightenment says special is 1 hit magic. But it actually is 2 hits melee. Special is four hits, Ranged Water. Weapon attacks do -30% damage. At the end of your turn, the monster starts Bleeding (power:0.3*[hits attempted]/[hits connected]). The monster can resist with a save at a +0 bonus (inflict with STR/LUK, resist with END/LUK). On skills, the penalty is reduced to -15%. Collage pics for the Awe weapons. I'm not sure if I'm supposed to ask again when it isn't answered the first time but here goes. Thanks roobee! I just fixed the rod. I also updated it to use PowLvl instead of MPLvl for the "draw mana" option. This only affects the Lv150G version, which now heals 395 MP. Anything leaving the GGB's this week, Hollow? Yes, all the surfboard/kneeboard/shortboards will be going rare! while they have been released since June 14, 2018. Or, am I missing something? Not only that but we are missing proper info subs on quite a few things. As far as weapons go, though, Agony's Embrace is what really comes to mind. And yes, I remember Kam posting the info on that one in the thread that was on going at the time, way back when. Having said that, that thread has since gotten too old and disappeared from the forum, taking the aforementioned info along with it. Would be nice to have the info posted in here along with the info on the boards.